Wellness in bloom at Stevens Point. This year the conference will be July 18-21, with pre-conference workshops starting on the 16th. It is without a doubt, the best wellness conference on the planet, and perhaps, one of the best professional conference experiences anyone can have. Participants can choose from over 65 breakout sessions and 15 intensive trainings (including my Wellness Mapping 360°™Wellness Coach Certificate Program http://www.nationalwellness.org/index.php?id_tier=90&id_c=275) with many of the leading people in the wellness and health promotion field. The conference has gone through several evolutions and being dubbed one of several “Wellness Ancient Ones” , a few years ago by Don Ardell, gives me a special perspective. It was July of 1979 when the Vice President for Student Affairs at Miami University (Oxford, Ohio) sent the health center director and this young psychologist from the counseling center to this conference he’d heard about. “Wellness” was a fast-growing trend and enjoying being buoyed by the “jogging craze” across the country. Cynics claimed that when that running fad faded so would this thing called wellness. We showed up and claimed our campus dorm rooms at The University of Wisconsin at Stevens Point. When we got to the first big welcoming assembly held in the gymnasium, the health center director, Bill Hetler, greeted all of us in shorts and a polo shirt and urged us all to go back to our dorms and change into summertime casual clothes. He then whipped out a toothbrush and began brushing his teeth on stage, right by the microphone. As everyone squirmed and groaned he asked “What? Is something wrong?” That was the beginning of his to-become-legendary comic routine on peer health norms. In the dorms for the next few years I attended as a presenter I was always on the floor where the male presenters resided in rooms assigned alphabetically. Ardell, Arloski, Allen. 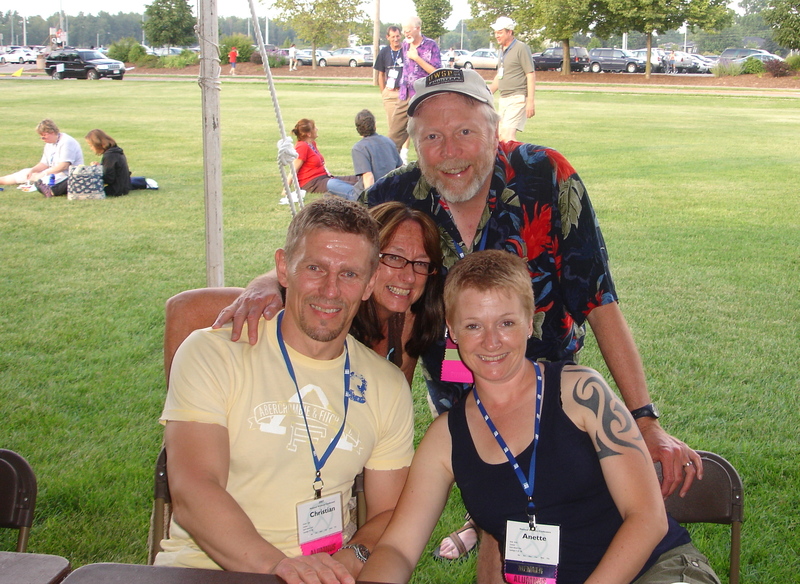 And thus began a thirty-some year friendship with wellness pioneers Don Ardell and Judd Allen. Jack Travis, Elaine Sullivan, Julie Lusk, Sandy Queen, Craig Washington, Denny Elsenrath, Jeannie Trotter, Bob Lord, Meg Jordan and so many more wonderful folks supported me over the years in my development as a wellness professional. From the beginning the most important part of the conference has been ,and still remains, the people. 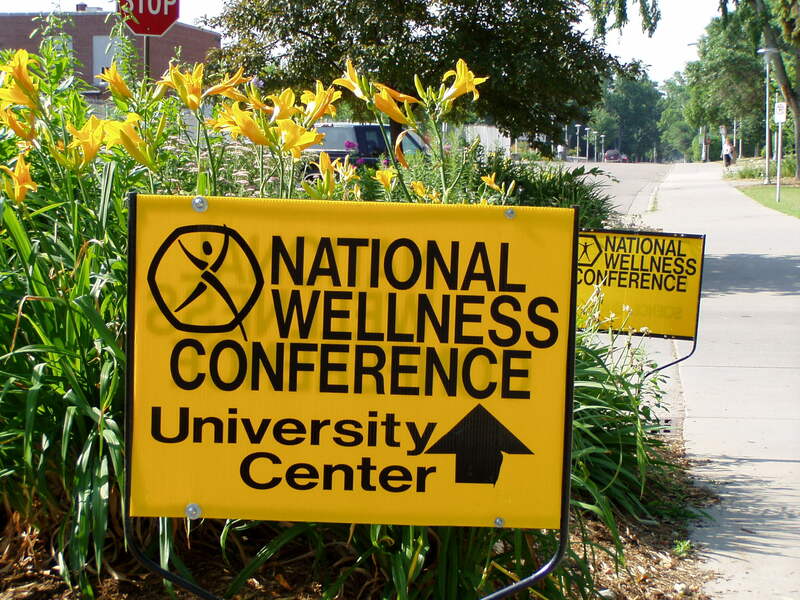 Unlike a lot of conferences, many people return year after year to learn more, to grow and to be embraced by a week-long culture of wellness and acceptance. I made lasting friends from around the country and around the world, from Amherst Junction, Wisconsin to Australia, Brazil and Denmark. I also made connections with colleagues who were seeking to improve their wellness programs and found value in the services and trainings I could offer. In those early days what the dorms lacked the dining hall more than made up for. It was state-of-the-art in nutrition at every meal with a choice of at least a dozen fresh fruits, vegetarian options, and food got rave reviews. The “Wellness Runs” referred both to the sudden experience for some of a high fiber diet, but also to the Half-Marathon, 10K, 5K, and 1 mile fun runs that took place. Schmeklee Nature Preserve, right on the edge of campus, became a place where I led nature walks amongst huge trees, whitetail deer, and bushes with ripe red raspberries. 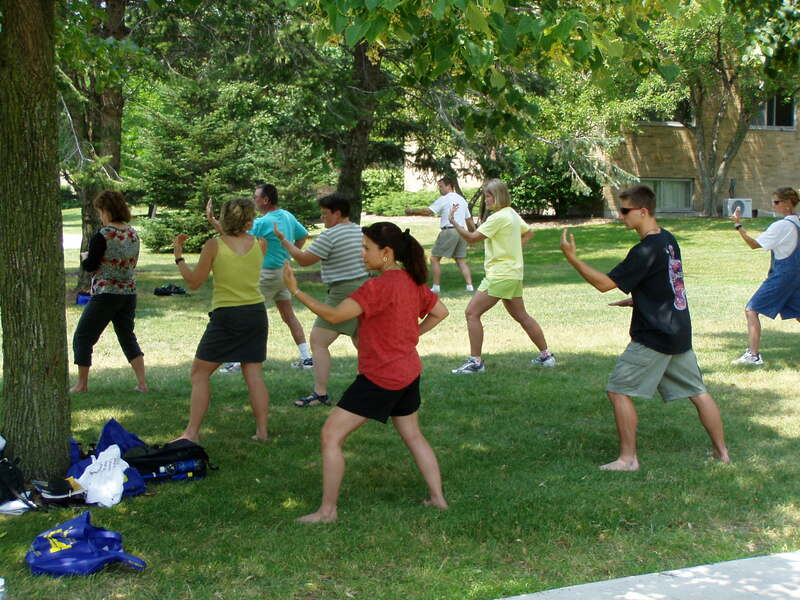 A Tai Chi Wellness Activity I presented at NWC. As the conference evolved so did my own professional presentation topics from stress management, environmental wellness, and Tai Chi to the first presentations at the conference on wellness coaching. I saw a true paradigm shift towards individualizing wellness through wellness coaching. At the conference today there are many breakouts and intensives just on wellness coaching. 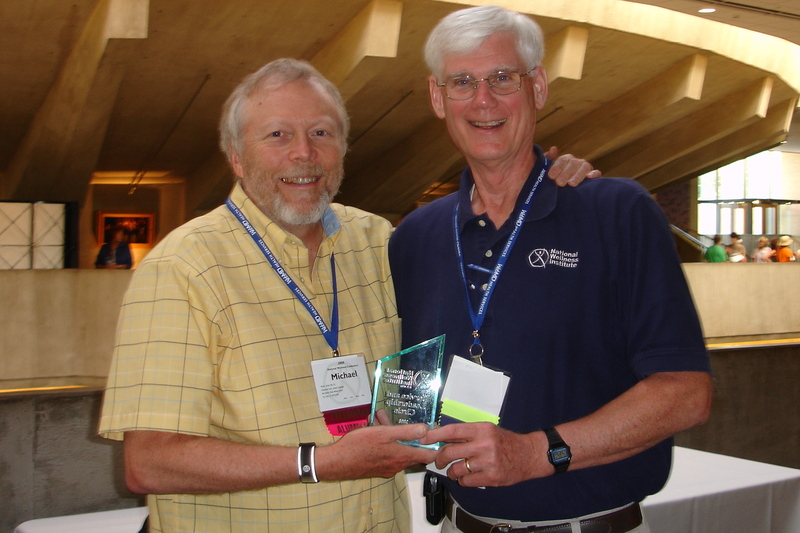 In 2008 I was honored to be inducted into The National Wellness Institute Service and Leadership Circle. Today the dorms have air conditioning and many attendees stay in the nearby hotels. The dining service changed hands a few times over the years and went from the best to the worst and has rebounded back to the top again (Thankfully!). The conference weathered the hits on travel and training budgets that followed 9/11, and the recent economic downturn. The National Wellness Institute itself is in a new evolutionary chapter with a wave of turnover in it’s board for the first time ever. There are experiments in conference format going on, and openness to change for the future is present. Every year I meet new people at the conference who are on fire about wellness, and I reunite with old friends who have been the ones keeping that wellness fire alive in the world. We spend a week combining that passion for helping people live the healthiest of lifestyles with learning about what works and how to do it better. Set your summer travel plans to show up in the middle of Wisconsin in the middle of July and join us in living, learning and being well!